The Gerovital H3 Equilibrium Vials with Collagen and Elastin is a highly effective serum that delivers exceptional hydration, plumps and revitalizes complexion. Powered by a rich concentration of collagen and elastine of marine origin, ferulan and organic Goji berry extract, the Gerovital H3 Equilibrium Vials provide immediate and long-lasting hydration, increase skin elasticity and comfort, brings smoothness and softness into the skin. Following subjective evaluation, 100% of the subjects saw an improvement of the skin hydration and 100% of the subjects declared that they will continue to use the product. Hydrotensyl Complex is the most complete anti-age active ingredient from marine and botanical origin. 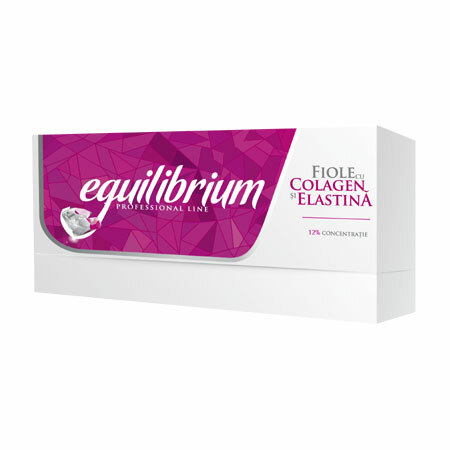 Made from the combination of three powerful actives: organic honey extract, marine native collagen and marine hydrolyzed elastin, it helps restore the dermis collagen and elastin, fades out wrinkles, maintains the cutaneous moisture and tonus, improves the flexibility and softness of the skin. Ferulan Complex (Rice Bran Oil and Ferulic Acid) scavenges free radicals and protects cells from environmental damage. In particular, it’s effective against two highly destructive free radicals, superoxide and hydroxyl radical. Reverses the effect of aging by slowing the formation of facial wrinkles. Organic Goji Berry Extract has a rich content of macro and micro-nutrients, with exceptional cellular remineralizing and energizing, anti-oxidative and anti-aging effect. Helps treating inflammations, ameliorates skin-hyperpigmentation and uneven skin tone, increases the synthesis of collagen. Markastore tip: For a visible boost, apply it as an intensive treatment for 20 days, twice a year. To maximize the effectiveness of the ampule’s active ingredients we recommend using a cosmetic device such as the Gerovital H3 Derma+ Anti-Wrinkle Activator Led & Ion Technology. INGREDIENTS: AQUA, MEL EXTRACT, PROPYLENE GLYCOL, GLYCERIN, PPG-26-BUTETH-26, SOLUBLE COLLAGEN, HYDROLYZED ELASTIN, PEG-40 HYDROGENATED CASTOR OIL, ETHOXYDIGLYCOL, SODIUM PCA, SERINE, GLYCOGEN, FERULIC ACID, ORYZA SATIVA BRAN OIL, PHENOXYETHANOL, ETHYLHEXYLGLYCERIN, ACRYLATES / C10-30 ALKYL ACRYLATE CROSSPOLYMER, TRIETHANOLAMINE, SORBIC ACID.